His And Her Wooden Wedding Bands - 5 Stunners! >> His And Her Wooden Wedding Bands – 5 Stunners! His And Her Wooden Wedding Bands – 5 Stunners! Couples who are looking for responsible, sustainable, eco-friendly ring options might not have considered wooden wedding bands. They’re a beautiful alternative to the traditional, but sometimes irresponsible, diamond rings and wedding bands that are normally purchased for marriage. There are some incredible designs that just can’t be achieved with metals, and the rings are hypoallergenic. Wooden wedding rings have so much going for them that it’s surprising that more people don’t opt for purchasing some of these beauties. Oh, and did we forget to mention that they can be carved with initials to look like they’re carved in a tree. Very old-school romance, but one with a new twist. This ring is a great choice for men and women. It’s a thickness that allows both sexes to wear it without it overpowering the woman’s finger. It’s 6 mm wide and 2.3 mm thick. It’s available in sizes 5 through 13, and these are truly matching wedding bands because they’re essentially the same ring with only subtle differences due to the nature of wood. 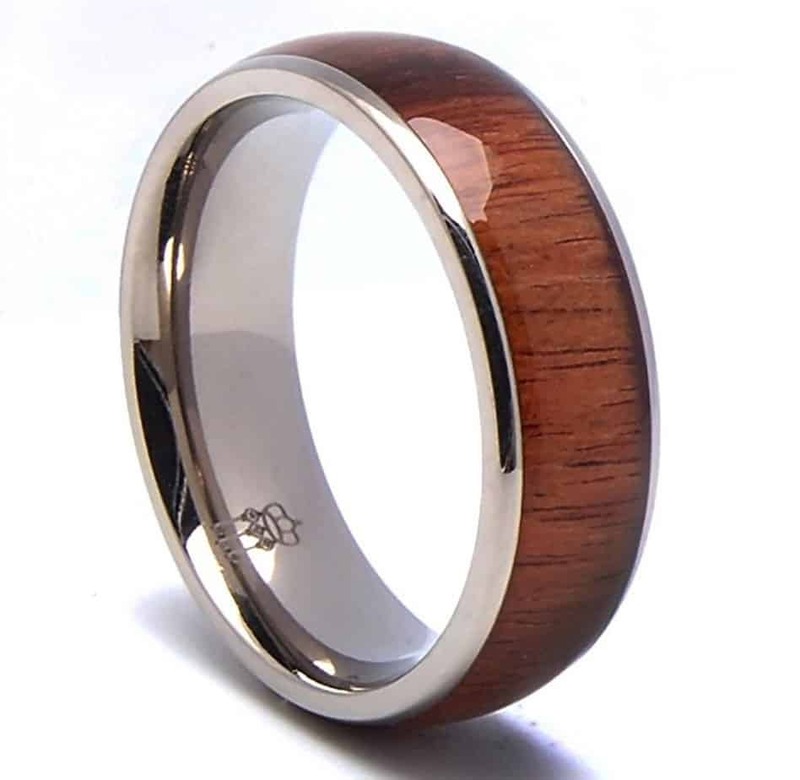 It’s made of natural olive wood that’s been hand polished with a natural wax to give the ring an incredible luster. This is a very lightweight ring that is perfect for a couple looking for a beautiful set of wedding bands. While some rings, like the one above, are created completely from wood. Others are created with an inlay of wood instead. This can give the ring more structural integrity and stop it from breaking easily. Great for those who are working with their hands often and don’t want to ruin their wedding band. The ring is 8 mm wide and 2.4 mm thick. The metal is titanium, which is a great metal for those who worry about the durability of the ring, but it’s also very light. This is great for both men and women who don’t want to wear a bulky, heavy ring. This is a great wooden wedding ring for the couple that wants to be able to have the same ring. It’s 5 mm in width, which is the perfect size for both men and women. It’s not too wide for her fingers and not to small for his. It comes in sizes 5 through 12 with half sizes available. 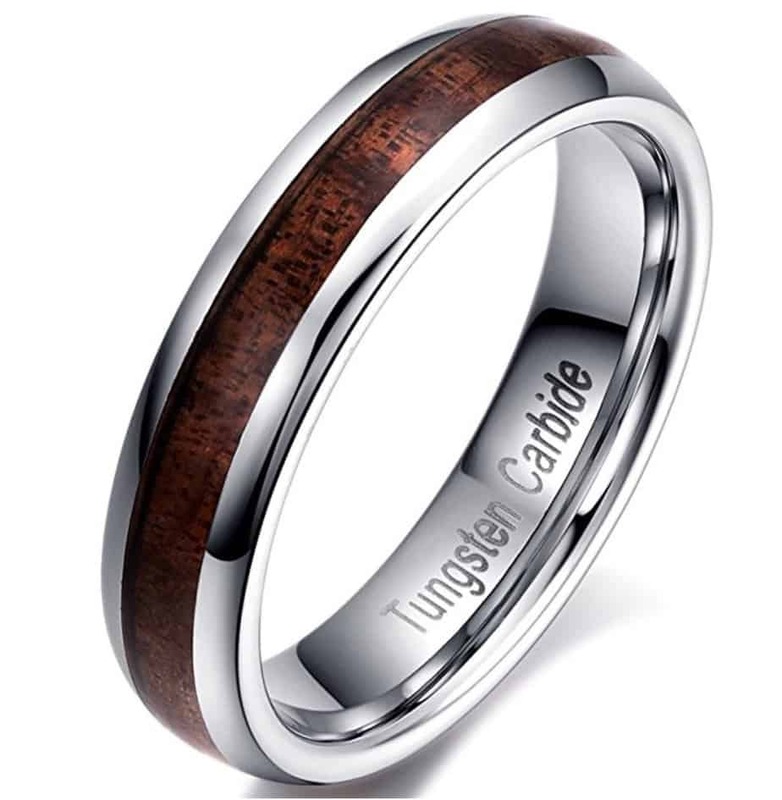 Tungsten carbide is a great material for a ring since it’s scratch resistant and hypoallergenic. There’s no cobalt in this ring, which can cause allergic reactions in some people. 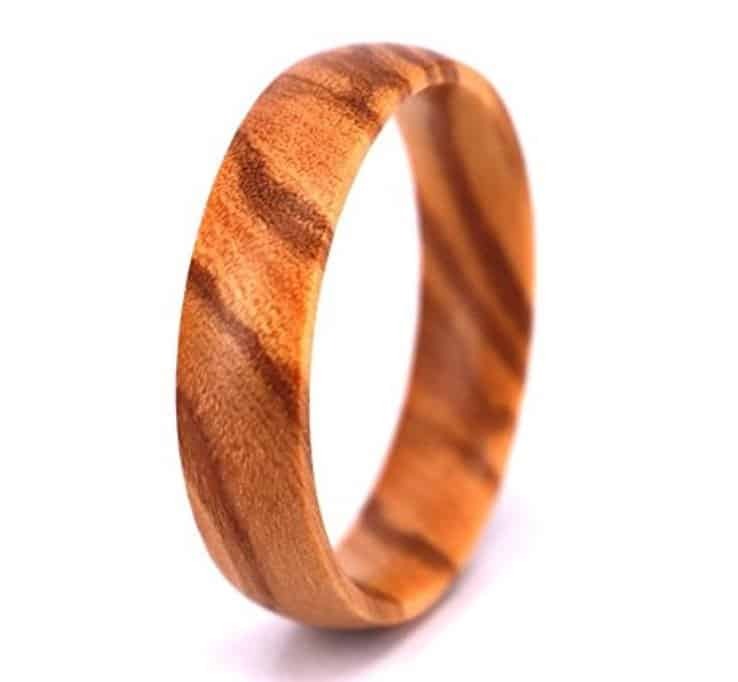 The wood is a beautiful Acacia that gives you a great vintage look to the ring. It can be difficult to find a stunning wedding band that will look great on both men and women without buying two separate styles. This ring is perfect for both men and women. 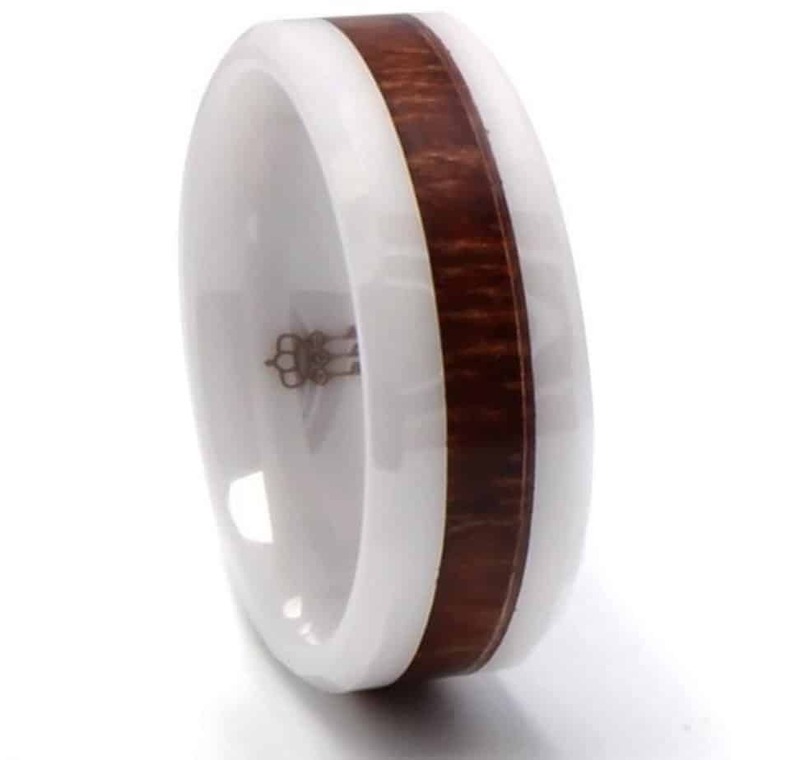 While it’s a bit wider than some of the other bands, the white ceramic and strip of Hawaiian Koa wood make it truly stylish for both sexes. The ceramic and wood combination can make this incredibly light, which is a plus or minus depending on your desired weight. Ceramic is a good choice for anyone who worries about a metal ring that can conduct electricity. A concern for anyone in the construction trades. The tapered edges of the ring make it incredibly comfortable. It’s available in 7.5 to 14.5 for sizes. Unfortunately, it’s not resizable, but the manufacturer takes returns in case you get a size that doesn’t work. This last option is a ring that is made to order. The crafter promises the ring in only a few days, too, depending on the engraving to be done. It comes in a variety of widths from 4 mm to 9 mm. It’s available in sizes 3 through 16 with half sizes available, too. The wood is a brown ebony wood that can be engraved with initials. The wood is polished and protected using natural waxes like beeswax and carnauba wax. 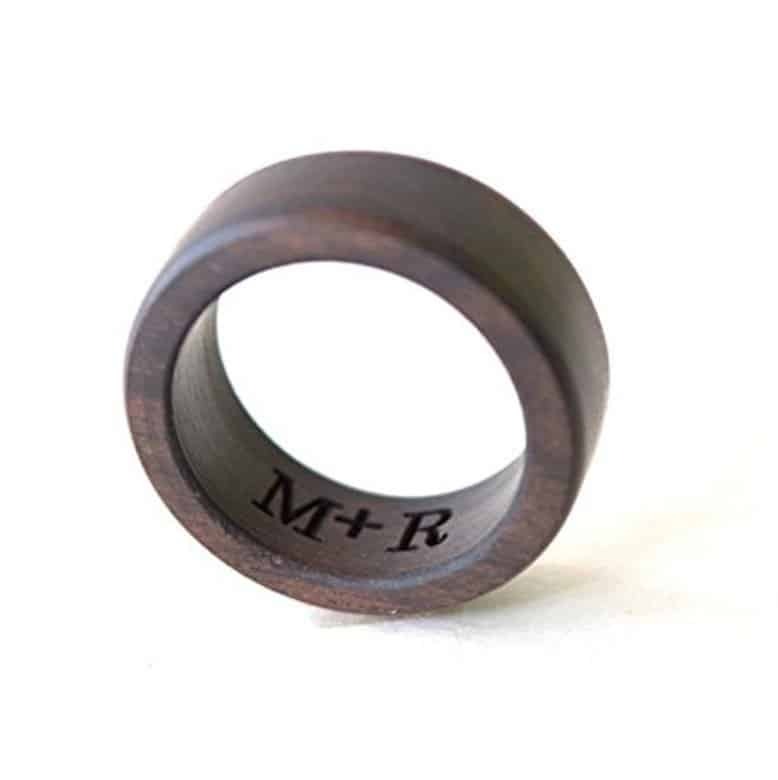 This wood is very lightweight, and perfect for a couple who want to have rings custom made to their liking. The personalization of the ring makes it extra special. The ring will have a slightly different look than in the pictures because of the nature of wood. Each piece is varied. When you choose a his and hers wedding band made of wood, you’re choosing a lightweight creation that will be unique and original while providing you with eco-friendly and hypoallergenic options. The rings are a stunning alternative to traditional rings in a metal that might cause allergic reactions. They’re sustainable when you can use wood for the construction, too.